Besides diet books, what else should you think hard about giving? Books you think a person SHOULD read. Example: grandparents who buy beautiful hardcover editions of beloved classics for teenagers. Pride and Prejudice makes a lovely gift IF you have an Austen-loving granddaughter. But if you have a granddaughter who loves YA dystopian novels, best to stick with those. Cookbooks; they should only be given to people who actually like to cook. (Exceptions: newlyweds or recent graduates. Everyone needs some basic cookbooks. They may not be thrilled to receive them, but they need them.) I used to interrogate men who bought cookbooks for their wives: “Are you sure she wants this? Wouldn’t she rather have a nice juicy novel?” I have softened over the years and now I just mind my own business and wrap the cookbook, knowing it can always be exchanged. Goodnight Moon. Every new baby receives multiple copies of Goodnight Moon. Pick a lesser-known favorite, and if the baby has siblings, choose a brand-new picture book. Chances are the family already has the classics. The big blockbuster of the season that everyone is reading (or says they’re reading) and that is popular with both genders and all age groups. Three years ago, that book was Walter Isaacson’s Steve Jobs. 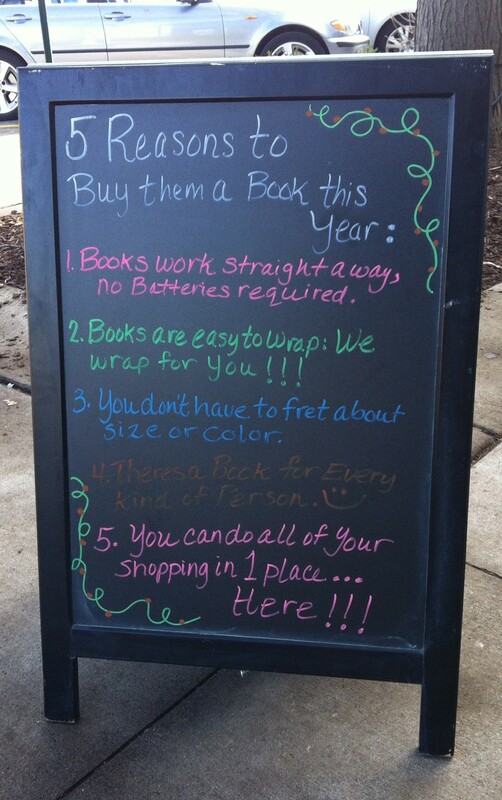 Many of those books came right back to the store in January. I admit I was one of those who jumped on the Steve Jobs bandwagon; I don’t think my friends returned the books, but you never know . . .
Books that carry a lot of emotional weight. Gift books should come with no strings attached. Maybe it’s just me, but my heart sinks when I receive a book with an inscription. Although apparently not everyone feels that way. A couple of years ago, a young man came into our store and returned a book on Bob Dylan he’d received for Christmas. It wasn’t until after he’d left the store that I noticed the inscription: “Dear _____ , Since we are both Dylan fans, I know you will love this book as much as I did. Enjoy! XXOO _____”. 1. Books work straight away. No batteries required. 2. 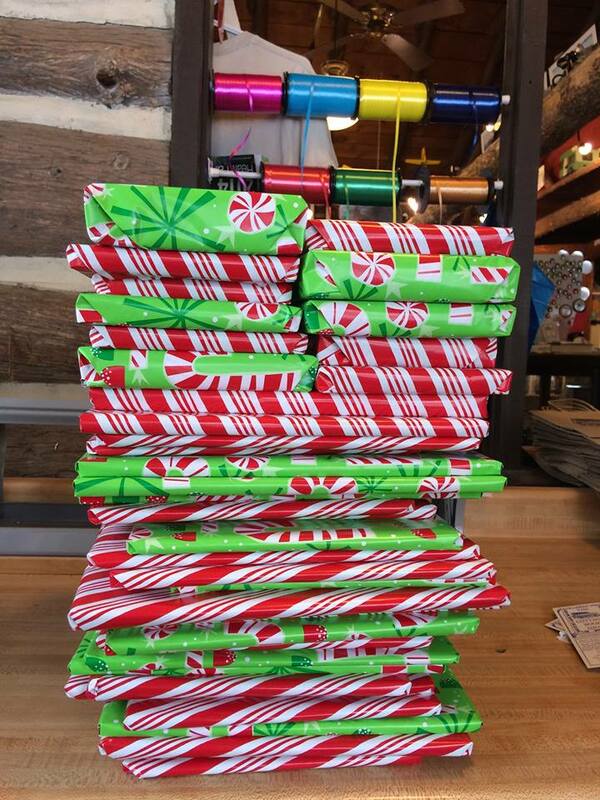 Books are easy to wrap. We wrap for you! 3. You don’t have to fret about size or color. 5. You can do all your shopping in one place . . . here!!! Working in a bookstore over the holidays is a lot of fun; it’s rewarding helping people choose books for people they care about. It can also be challenging, especially when we are asked to find books for a nephew who doesn’t like to read; a father-in-law who is extremely conservative and likes large print; and a mother who likes mysteries that aren’t too violent. But, as our chalkboard says, there’s a book for every kind of person. We all want to know what other people are reading. We peer at strangers’ book covers on an airplane and lean over their e-books on the subway . . . 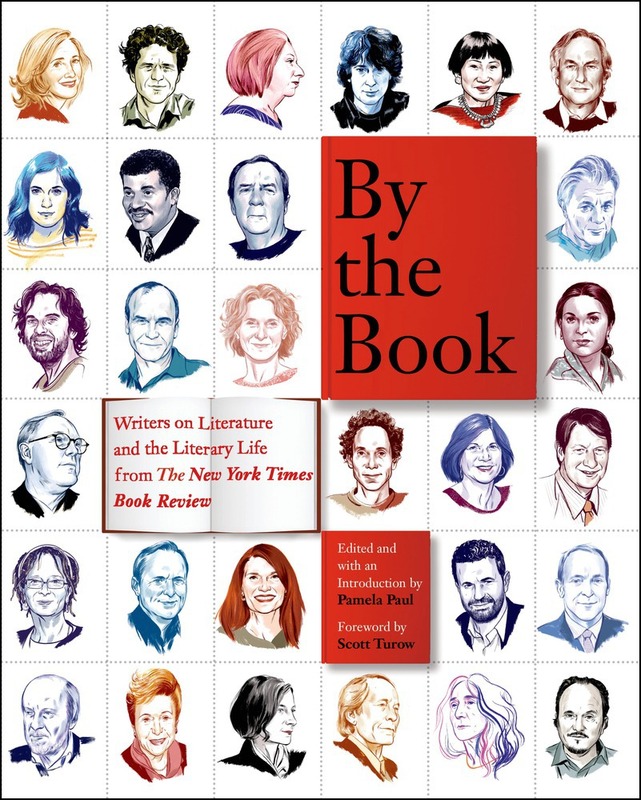 When I launched By the Book in The New York Times Book Review, it was an effort to satisfy my own genuine, insatiable desire to know what others — smart people, well-read people, people who are good writers themselves — were reading in their spare time. The idea was to stimulate a conversation about books, but one that took place at a more exalted level than the average water cooler chat. That meant starting big, and for me that meant David Sedaris. Who wouldn’t want to know which books he thinks are funny? Or touching or sad or just plain good? In coming up with the questions for David Sedaris, and then for those who followed, I decided to keep some consistent — What book would you recommend to the president to read? — while others would come and go. If you’re going to find out what books John Grisham likes, you’ve got to ask about legal thrillers. When talking to P.J. O’Rourke, you want to know about satire. Ann Patchett, who is one of the interview subjects in By the Book, is also the owner of Parnassus Books in Nashville. Her store has a wonderful blog, and today’s post (“What Book People Give When They Give Books: The Ultimate Holiday Guide”) lists some spot-on gift-giving suggestions for the readers on your list. The clever categories include “for the party host, a better gift than a bottle of wine”, “for anyone who’s looking for a book as good as Unbroken“, “for the picky, discriminating book addict who has already read everything on earth”, and “for anyone whose soul is not made of ice and rocks”. Happy Black Friday — stay home with a good book! If you’re lucky enough to have an independent bookstore nearby, tomorrow (Small Business Saturday) is a great day to stop by for some recommendations. Thanks, Carolyn! Hope you had a great Thanksgiving. Gloria, hope you had a wonderful Thanksgiving! Thanks for reminding me about “the day of men with cash” — I’d forgotten Sue used to say that; very funny! I love giving and receiving books as pressies, but yes, it isn’t always easy picking the right one. I would certainly NEVER give a weight loss book. To anyone! Can you believe anyone would do that? Great post. I love to give books as gifts – but I also have to admit to myself that I can’t make people read the books I want them to. I would LOVE to receive By the Book as a gift. I also love Ann Patchett and have recently discovered her blog. I will probably be buying Cheryl Strayed’s Tiny beautiful Things for a few people this Christmas because it seems to fit so many needs. I can imagine its fun as well as frustrating to be on the receiving end of so e of those customers questions. It’s really fun 99% of the time!